Are you in need of a chocolate filled treat? These eggless Brownies might be just the solution! They only contain a few, basic ingredients and you can make a delicious dessert or snack in no time. Egg free brownies are the perfect dessert treat if you are out of eggs or if you need to restrict eggs for dietary reasons. If you are looking for more egg free desserts you have to check out this Eggless Yellow Cake as well! 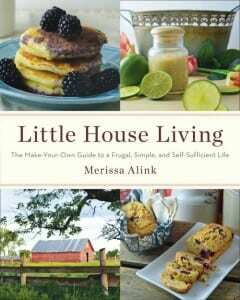 If you love simple recipes you might also enjoy my book, Little House Living: The Make Your Own Guide to a Frugal, Simple, Self Sufficient Life. 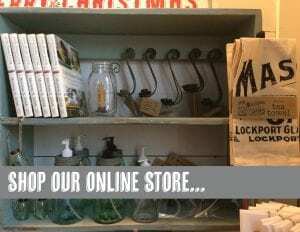 It’s filled with over 130 food and DIY recipes that you can all make from scratch! Mix together all the ingredients. Dry ingredients first and then the wet. You should have a nice thick mixture. Make sure all the flour and baking powder are mixed in otherwise you will have sour clumps in the brownies and that’s not fun. 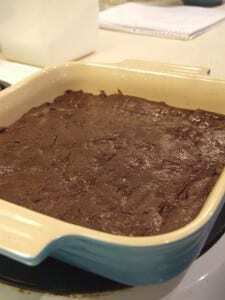 Pat the brownie batter into a lightly greased 8×8 (or similar size) pan. My Le Creuset has treated me well for many years and always bakes these egg free brownies to perfection! Bake at 350F degrees for about 20 minutes or until a toothpick comes out clean. You might also want to learn how to make Butterscotch Sauce for something top them with! 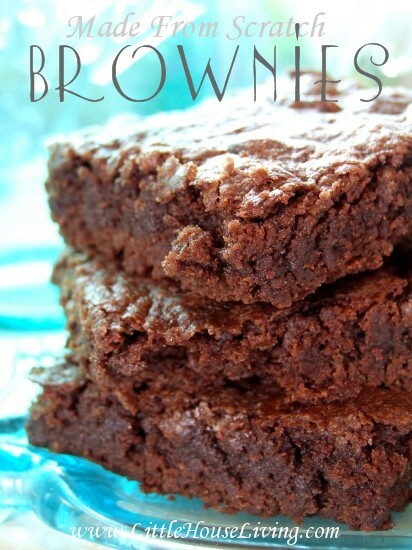 See below to print the Eggless Brownies Recipe to add it to your Recipe Binder! You would never guess that these are egg free brownies! Deliciously soft and chewy and perfectly chocolatey. You should have a nice thick mixture. Make sure all the flour and baking powder are mixed in otherwise you will have sour clumps in the brownies and that's not fun. Pat the brownie batter into a lightly greased 8x8 (or similar size) pan. My Le Creuset has treated me well for many years and always bakes these egg free brownies to perfection! Bake at 350F degrees for about 20 minutes or until a toothpick comes out clean. Need more brownies? You might want to give the Best Fudge Brownie Recipe a try. They are a thicker, fudgier brownie. Of course, in the summer I like to switch things up and make these Zucchini Brownies. Looking for more simple, delicious recipes that you can make quickly and easily? My book, Little House Living: The Make Your Own Guide to a Frugal, Simple, and Self-Sufficient Life has over 130 DIY projects and recipes just like this one! How do you make perfect brownies? 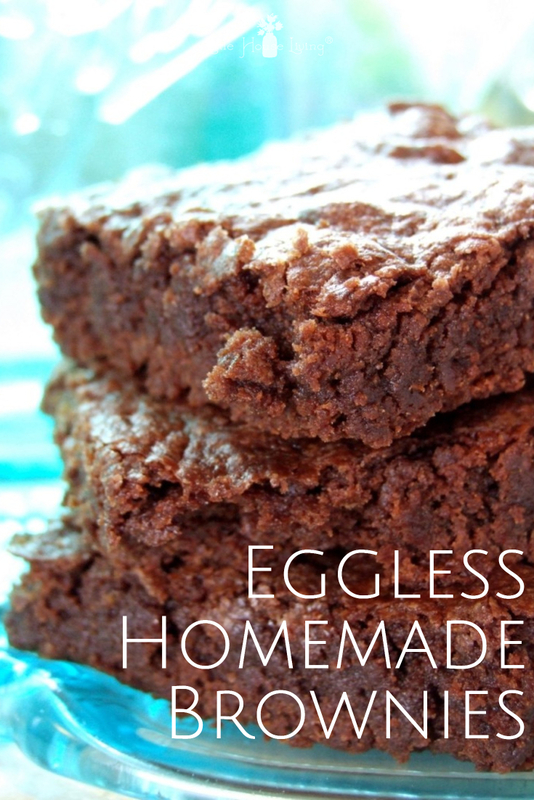 Will you try this made from scratch eggless brownies recipe? What add-ins do you put in your brownies? Awesome! Added to my recipe box! My son’s allergic to eggs & dairy so this is perfect! I forgot to comment on these, but they have saved me a few times when friends happen to stop by for dinner (and i have no dessert on hand) as well as when my husband wants a late night sweet tooth fix! great recipe Merissa, thanks again for sharing it! Hey Merissa, Is it Baking Powder or Baking Soda? The recipe states powder and under the picture states soda. Just wondering? Thanks & Blessings to you! Yum. We’re doing a low grain, no dairy diet, so this is almost there! Thanks. It was amazing! No eggs or milk and yet it turned out to be the best brownie I’ve ever tired. Yum! Added some chocolate chips and peanut butter and they were delicious! Yummmmmmmm! I have a son with an egg allergy so was starting to test out some eggless brownie recipes to satisfy him and the other 3 boys in the house. We love this! It has been requested almost weekly around here since I found it a couple months ago. Thanks for a great recipe! Oh…by the way…they are in the oven right now..again… And we are planning on having it with homemade fudge sauce and ice cream tonight. These were great – perfect for my kids with dairy & egg allergies and they taste delicious! Thanks for sharing! Thanks for sharing this! (and the other egg free recipes!) 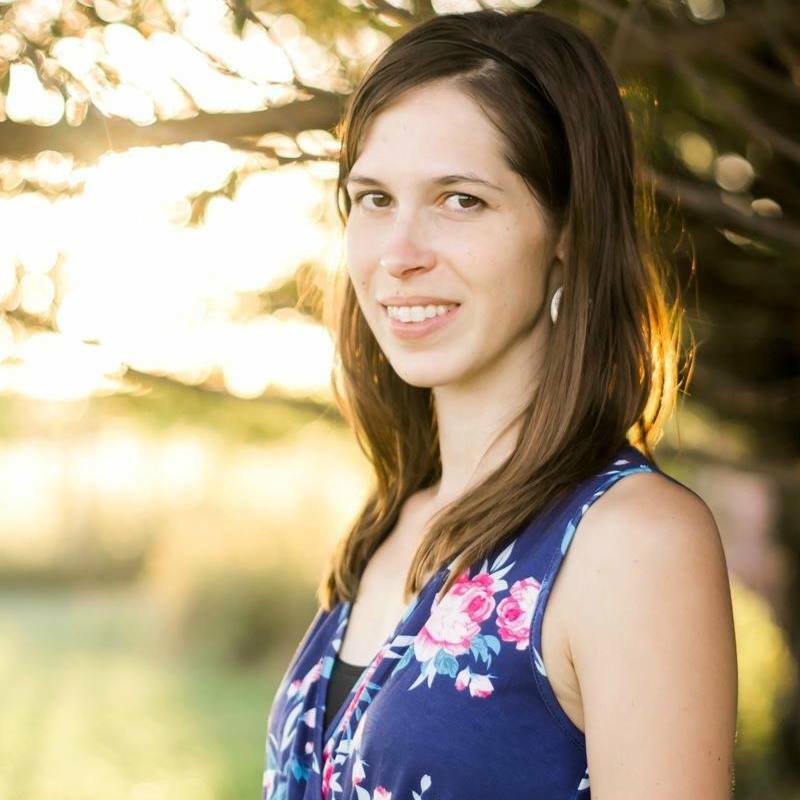 I developed severe food allergies in adulthood and it stinks! So I am so glad to find some yummy recipes! Made it up tonight (waiting on them to cool) and the batter was definitely yummy! Looking forward to the actual brownies! Are the baking powder, salt and vanilla measured with tablespoons or teaspoons? I love the yogurt addition idea! I just put a batch of these in the oven and I can’t wait to taste. I needed a vegan version so here are my alterations: I used almond meal and flax meal 1c almond 1/3c flax), I used coconut oil and I melted 1/4c semi sweet vegan chocolate chips into it. The batter tastes divine!! I also used organic raw cane sugar. Your recipe was dairy free which I needed due to allergies so thank you! I just wanted to thank you again for the fabulous dairy free brownie recipe. My WHOLE family (I mean extended and all) and close friends all love these. I use coconut oil in them so it solidifies once they cool…so yum. I call them 20 below brownies because I actually freeze them and serve cold with a cup of espresso! These brownies were amazing! I have been looking for one that doesn’t turn out so cakey…so far, this is the one!!! I also added raspberry jam to the top and swirled it into the batter…oh they were good. I also used the Speical Dark cocoa. I ate a whole row while they were still semi-warm. It was hard to hold myself back from eating even more. Do you think they would still turn out if one used less oil? That’s my only con about them. Either way, I will be making them again! Thanks…yes, of course – applesauce. I will try that next time! The pan is gone in less than 24 hours. I tried these again tonight, subbing the oil for applesauce…definately not the same result or taste. Sadly, it was like eating rubber chocolate. Guess I will just have to opt for being very unhealthy once in a while. I just wanted to say that these are very tasty and I guess I don’t know what I am doing wrong but when they are finished cooking they fell apart. They were perfect in every way except that is was crumbling before I got them out of that pan. Can you help? I don’t know what I did wrong, followed everything to a T.
Hmmm, I’m really not sure. We’ve made this recipe many times and haven’t had that happen yet. Did you use a different kind of flour? I used pastry flour, I thought it was the same as reg flour and it only made things lighter and fluffier, guess I was wrong. They are still really good. These brownies are quite wonderful. The only other time I have ev er baked brownies was at my nanas house and; it was too complicated and I was afraid of messing the recipe up if I were to do it by myself. This recipe turned out wonderfully and I plan to add this to my list off recipes. Even one of my sisters who does over do it with sweets; not as much as other people, she had a bucket load of them. I plan to use chocolate chips next time just so there is a little more than plain old brownies. Overall they were absolutely good though. How would using coconut oil affect the outcome? Hoping to make these tonight! Can you use plain cocoa? Plain cocoa should be unsweetened cocoa in general. What brand of cocoa did you use? My cocoa doesn’t have a brand on it so I’m not sure. I buy it in bulk from Azure Standard. I made a batch last night and threw some Ghirrardelli milk chocolate chips in and on top. It’s a good recipe, but with the added flour (compared to hersheys best brownies), I think it needs more cocoa powder. AND… Although it was yummy, the center was extremely gooey, after cooking for 25min. I just put another batch into the oven, after doubling the cocoa powder and vanilla… AND the chocolate chips, although that was an accident that the kids won’t mind. OH!! I use melted butter, not oil. I can’t wait to see how these turn out! You would need to add more time but since I haven’t doubled this recipe I’m not sure just how much. I would guess it would be between 30 to 40 minutes. I just made these for my egg & dairy allergic 2 year old and they were delicious! We added mini chocolate chips and crushed pecans. We also baked a few as cookies for 10 minutes and OMG they were delicious!! I just made these tonight. I wanted somethimg sweet but had no eggs to make traditional brownies. I went to pintrest and typed in egg free desserts. Needless to say they are great! I did ad a splash off almomd milk just because the batter seemed a bit dry and i sprinkled milk chocolate chips on top. Awesome! Awesome! Awesome! I have used several of your recipes and really love them! Our favorites are the zucchini brownies & the oatmeal cream pies. I’m not having the same results as everyone else with these brownies. We gave these as Christmas gifts in mason jars, and my mom & sister said they came out really dry & crumbly. Well I didn’t make them before I gave them, and now I feel terrible. I tried them last night & my brownies were pretty dry, and crumbly, too. Any suggestions? I guess I’m not sure, this recipe always comes out quite moist for us? I recently had a surgery that made me highly sensitive to lactose. I was already allergic to eggs. When I got down about not being able to eat cookies or dairy. (I’m healthy but have a huge sweet tooth) my partner found this and made them for me. Thank you so much for this amazing treat. It fixed my sweet tooth and attitude. My husband has Parkinson’s Disease and lately has a nonstop sweet tooth due to medication. 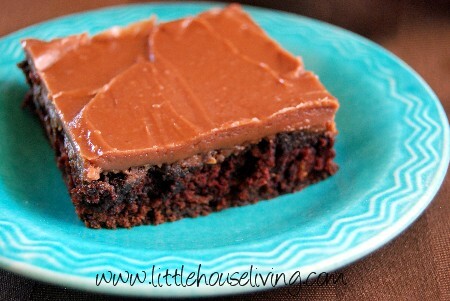 These brownies have become his favorite and they are so easy for me to whip up! I know to make double and triple batches as when friends or grandkids stop by they are gone in a flash! Thank you so much and the no eggs or milk is an extra plus! These brownies were nice and moist, although next time I’ll add a little bit more sugar because it was slightly bland for my liking. A good brownie for those who like a cakey texture. First of all, I love this! I was also wondering if you knew (approximately) how many calories is in this? I really wanted to use this recipe but i don’t really understand the process. is it mixing all the dry ingredients first and then the wet ingredients? do u mix after each addition of wet ingredients or just throw them all in a bowl and mix? can i use separate bowls for wet and dry ingredients? sorry to complicate things (only 13) luv baking though!!!!!!!!! First you mix together all the dry ingredients in a bowl, then add in all the wet ingredients and mix until everything is combined together. Good Luck! These are great! Didn’t have any eggs in the house and felt like baking and these were moist and delicious with crispy corners. Love! These were delicious! Very moist and quick and easy with crunchy corners. Yum! We’re so glad you enjoyed them, Vanessa! Thanks for stopping by. Instead of water could I use milk instead? Would it be okay if I made these in a cupcake tray? Would they turn out alright because I’ve seen other brownies be made that way. I had the idea of adding a different kind of chocolate surprise in each one. Like m&ms or a little hershey’s bar and others in the spirit of Halloween. I haven’t previously made this recipe before but thought about giving it a try. 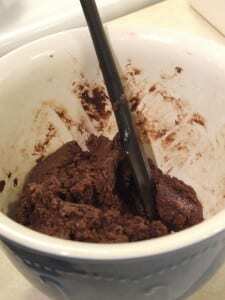 I haven’t had success in making good egg-free brownies in the past and I’ve tried several different recipes. I haven’t tried them that way before but it’s worth a shot! Hi..I want to try your recipe but my son is also allergic to vanilla. What is the substitute for vanilla?? Are you able to use a different extract? 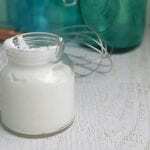 You could try almond extract or even mint extract if so. I have a son with multiple food allergies. He was diagnosed at 3 months old and is now 11. Needless to say I have become quite the baker since his diagnosis and there isn’t much I can not make…but brownies eluded me. Every time he sees brownies he says I wish I could have a brownie 🙁 so I have tried recipe after recipe and searched and experimented but nothing really came out close. 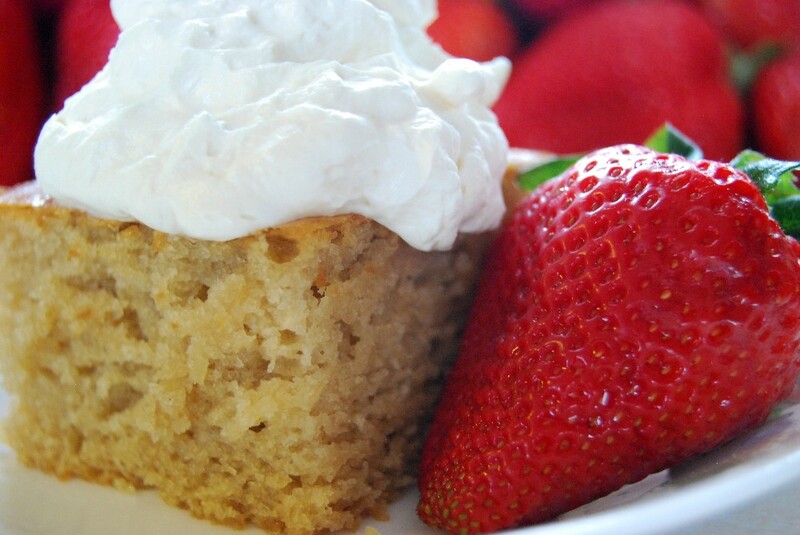 I just found your recipe and so many wonderful reviews…I have a double batch baking right now. I can not wait to see how they come out. I did sub the water with cold coffee for a richer flavor, and added 1 cup of mini Chocolate chips into the batter. Thank you so much for sharing your recipes 🙂 I just looked in at them they look BEAUTIFUL! I am beyond excited! I really hope you enjoy them! Thank you for this recipe! I’ve made it a few times and we really like it. Three things, though, is that when I make the batter it doesn’t look like yours; it’s not as doughy. Is that a problem? And, I normally take them out at about 15 minutes, and they are already a bit cakey. Do you have any suggestions for me to make them more moist? Lastly, do you add the 1/2 cup of water in one go along with the oil, or do you add it bit by bit as you are mixing? It could be that you are at a different altitude than I am (we are very low) so they may not turn out exactly the same and you may need to adjust your baking time (which it sounds like you already did 🙂 ) I add the water in with the oil. I loved these, though next time I’ll add less salt. I personally loved the dense texture, not too gooey. 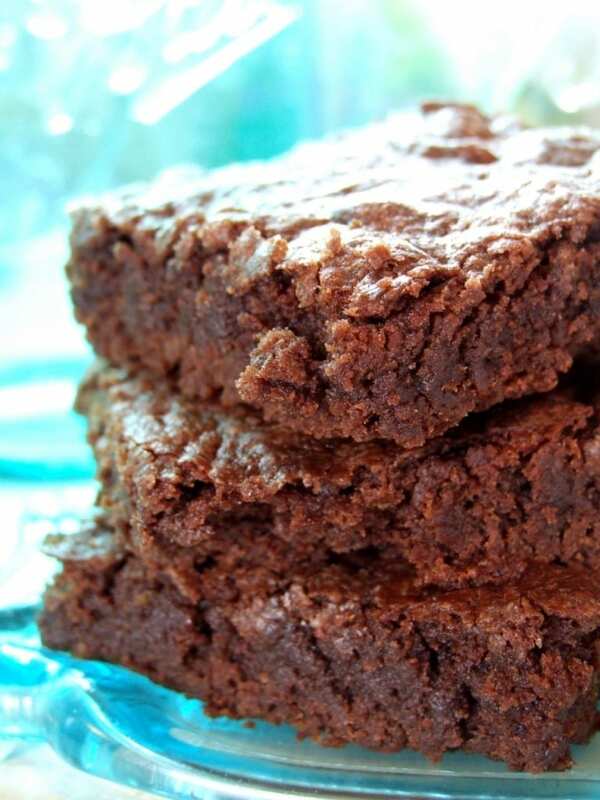 Great recipe for those monents when you need a brownie but you have no eggs! These were absolutely incredible and I will actually be saving the recipe. So rich and dense. Thanks for the recipe! I had a rough day and was dying for some brownies, but I didn’t have any eggs on hand. 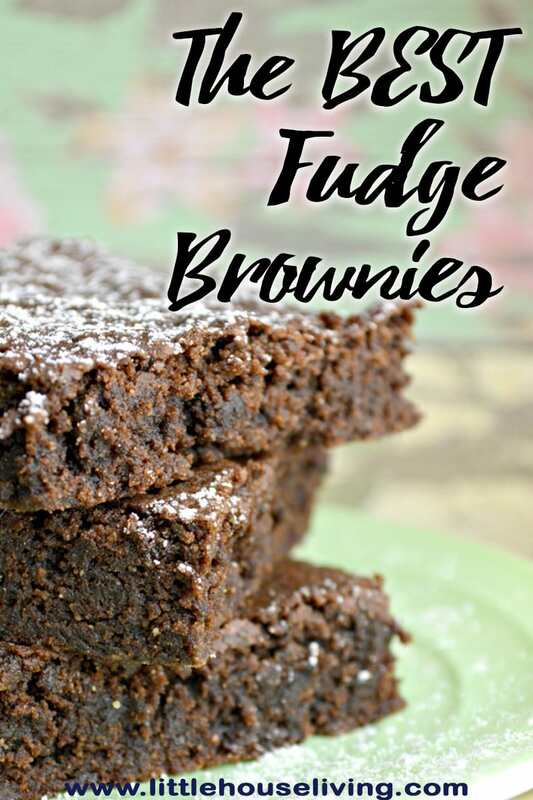 Googled “egg-free brownie recipe” and found this page. I’m a chocolate lover, so I think I might increase the cocoa from 1/3 to 1/2 cup, but these are perfect otherwise–moist and crumbly! Made a batch of these with 1/2 cup cocoa, and they are amazing. I’ve always used the Hershey’s Best Brownies recipe, but these are much better. And now that eggs are $3.28/dozen, they’re cheaper to make, too! I don’t have vegetable oil:/. Can I use olive oil or coconut oil instead? Yes, I use olive oil in mine all of the time 🙂 It’s just a stronger flavor. Coconut Oil would work great too! Thank you so much for this recipe. I was a little skeptical at first because the batter looked so thick in the images. Not at all the consistency that I am used to brownie batter being. But oh my gosh they turned out AMAZING. I used brown sugar instead of white (since I was out of white) and they turned out perfect. I am never going to use another brownie recipe ever again. This one is hands down, the best. I’m so glad you enjoyed them! And that sounds like a great substitution in this recipe. These were so yummy!! I whipped up 2- 9×13 pans for my large family crew and we might of got 2 days out them! Thanks for sharing! When you doubled it, did you need to adjust any ingredient amounts or cooking time? Thanks! I am eleven years old and I am allergic to eggs and nuts and coconut, and as a result, I have never been able to find a brownie I could have. I found this on the Internet and I tried it out the same day. It was delicious and I loved it-and so did my family! Thank you! Yummy I love making brownies and have always wanted to try making them from scratch – thanks for the recipe, found you the Creative Muster! Looks so yummy. I love gooey brownies. Shared. Thanks for joining the Inspiration Spotlight party! Great recipe! Love brownies, anxious to try this one. Visiting from Creative Ways party. These look so fudgy and delicious. I am pinning for later. Thank you for this recipe. I used a gluten free flour mix. They turned out great!! Will definitely be making these more often. There are no dietary reasons for me to make brownies without eggs or dairy, but this is my go to recipie. It’s the absolute best there is. Plus it contains ingredients I always have on hand. These are amazing! I’ve made this brownie recipe repeatedly. It’s been my go-to dairy free dessert to bring to get togethers. I use canola oil or coconut oil to keep it completely soy free as well. I’ve been sharing it with many. Thanks! I am 13, and had a sweet tooth, but no eggs! First recipe I looked at, I read the reviews and tried it the same day! It was good, but very crumbly… what did I do wrong? I would still recommend it if it’s just for an at home snack! DELICIOUS! ? I made these brownies and they turned out terrible 🙁 I followed the recipe to a T and they taste bad. What did I do wrong? I would suggest looking at the kind of oil you used. In this recipie I find it makes a huge difference. For my family, a light olive oil is the favorite. This is a keeper! Made this for a friend whose son has an egg and diary allergy; it reminded her of whole food’s vegan brownie. I don’t have allergies and I’m making this again since I tend to want brownies when I don’t have eggs in the fridge. The only thing I added was a tbs of expresso instant coffee to bring out the chocolate. Yum!!! These are incredibly bad. They have zero flavor. I taste tested them with different people and no one liked them. To me, they taste like the fake play-doh my mom used to make when I was a kid. Sorry my comment is unsupportive but the recipe is missing something, probably several things. Great quick recipe! Needed a quick night study snack for my partner and I. I did substitute the vegetable oil with 1/2 cup of tahini, ditched the sugar, used 3 tbsp of honey instead and adjusted the water content accordingly due to less dry ingredients. Turned out really good. Pinned!! Oh, I wish I had a smell-phone! Worst brownies I have ever had. I make brownies all the time and thought why not try a vegan brownie… My god why!!! My son is allergic to eggs. These brownies are amazing! I ended up adding about an 1/8 of a cup more water and oil, and tons of chocolate chips. They end up so nice a chewy. This recipe is so good. These are amazing. I substituted organic brown sugar, cacao instead of cocoa, coconut oil, hot strong black coffee for the water, and added half a teaspoon of almond extract with the vanilla. 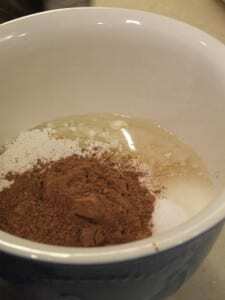 Whisk the flour, cacao, baking powder, and salt and set aside. In a microwave safe measuring cup combine the coffee and coconut oil, warm in microwave if necessary to melt oil. Whisk in brown sugar until disolved and then mix into dry ingredients. I also melted about 1/2 cup of chocolate chips with 2 teaspoons of coconut oil and spread it over the top when I pulled them out of the oven. My new favorite recipe, thanks so much. This recipe is amazing!! I have a dairy sensitivity so these are perfect! I tried a vegan recipe I found on Pinterest and didn’t like the rubbery texture they had. These brownies are just right!!! Thanks for sharing! I just found this recipe and it is great. I needed one with no eggs and milk and I am so surprised this came out so good.The last few times I tried to make brownies they were disasters. I did have to bake them a little longer but it was probably my oven. But they did turn out great. Oh, I’m so glad to hear that you could use this recipe! Unfortunately, we deal with multiple food allergies in our family too so I know the struggle very well. I do have a few more egg free recipes here: Egg Free Recipes, the Chocolate Cake recipe on that page is also dairy free. 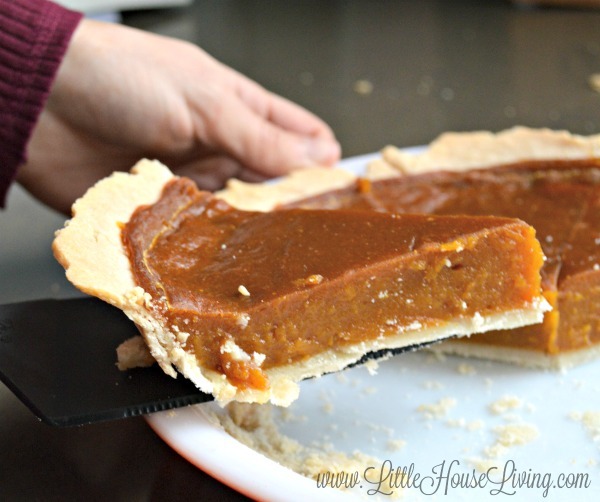 I’ve also been working on an eggless/dairy free Pumpkin Pie recipe that is SO SO good! I want to update my previous post because these brownies are worth it! They were a hit with my son – he even ate more than usual (which makes me happy as he’s a picky eater). I couldn’t wait to taste test myself and finally got to try what was left over… Oh they are perfectly delicious. Even better than other recipes that use eggs and milk! Mmmm mmmm mmm! This is my new go-to Brownie Recipe!!! My batter is not thick like yours, and I think I’ve read the recipe 7 times now trying to figure out why. 🙂 Is it really 1/2 cup of oil AND 1/2 cup of water? My son has egg allergies and I want to try this recipe out for a party. How long should the brownies be baked if we double up the recipe for 9 X 13 pan? I haven’t tried them in a 9×13 so I’m not sure of an exact time but you should be able just to keep an eye on them and do the toothpick test to see when they are cooked. Attempting these tonight! Thanks for this recipe. This is so bizarre! I made these. Delicious !! However I lowered ge sugar to 3/4 cup. My batter was runny! It was not firm like pictured in this post. Delicious brownies though. This recipe is a keeper! Hi! I just tried your eggless brownies tonight! Yummy! I am going to go over your website and look at all the recipes. I use Evernote for my Electronic Cookbook. Love it! Anyways, thank you for the recipe! Should I preheat the oven or start it when i put the batter in it? You can pre-heat. If you place the brownies in before pre-heating just add a few extra minutes of cook time. I use many of your recipes I have not made these yet ,yet ,lol.Just made a big chocolate cake today. Are you going to have a good oven to bake while you are in your new abode.I hope so nothing like a good oven. I look forward to your recipes . I have to say how wonderful it is that you were listening in order to chose this new life ,bless you all,you will be rewarded. Great recipe and very quick to make but something has changed for me in the recipe. Earlier the batter used to be nice and thick just like the pics but now it’s quite runny and take more than 20 mins to bake. I checked and rechecked the recipe and my measurements so many times but can’t find where I’m going wrong. Though, end result is still yummy :)! Your recipe is awesome! Just great! Though I have not tried it out yet but I am sure that I will :)! Its sooo simple but looks great! That was a really easy one. 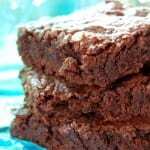 I had been searching for simple, yet delicious, butter-less brownie recipe and at last I have come across it! I have just one question for you… I don’t have unsweetened cocoa powder so I will be using semi-sweet cocoa powder. Then will I need to decrease the amount of sugar ? If so, then by how much ? Please give me some advice! I haven’t tried this with that particular product but yes, I would assume you would not add as much sugar. I’m not sure how much though since I haven’t tested it. These are great! One of the easiest and most successful vegan brownie recipe I’ve made. My batter was runny but these still came out perfect. It was my luck to decide to use your recipe among all the choices for eggless brownies. I just was craving them and had no eggs, what to do! The photo looked like such a yummy brownie and all the necessary ingredients were in my pantry. Oh my, were these delish. Thanks so much for an easy and reliable recipe that I know I will use often. 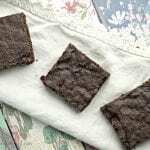 (Some of the similar recipes out there are so complicated and the results in their accompanying photos do not seem to resemble a traditional brownie.) And, I had some vanilla ice cream in the freezer, double yay! Thanks, again. I’m not allergic to anything but decided to try out your recipe – and I’m glad I did! It tastes excellent, and the texture of the brownie is lovely! I was slightly worried with my batter because it was so thick, but it turned out perfect. Thanks for the recipe! Is there a printer friendly version? I made these tonight and they’re a hit! I didn’t have any baking powder on hand so I subbed 1/8 tsp. baking soda instead and they still came out perfect and delicious! I made a batch f these and they were so good! I went to make a double batch another night and discovered i didn’t enough cocoa! Oh no! What to do? So I added a couple tablespoons of cinnamon. Amazing! Making these as I type as a late evening chocolate fix!! Lol. I did omit the water and oil and replaced them with with Butter and root beer.. Hopefully they turn out yummy!! This is just what I was searching for! Dairy free and egg free without having unusual ingredients. I added 1/2 cup dairy free chocolate chips to make it a little more chocolately, but I loved them! Thank you! There’s a puddle of water in the middle of the brownies. I keep adding more time, but now the sides are burned. For 2 years I’ve tried countless egg-free brownie recipes and they were all terrible- either totally inedible or not really brownies. These were great! I made the recipe exactly as is, but now that I have the basic one down I’ll definitely be using it as a jumping off point for different variations. I’m so glad you enjoyed it! Yes, this recipe is super easy to modify or add to. Have fun! A US cup is 240ml. Tried this recipe and it turned out terribly in so many ways. It did not have a good taste, was hard around the edges but fell apart completely in the middle, and there were oil puddles on the top. I followed the recipe exactly so I’m not sure what went wrong. These are amazing! I’m always running out of random ingredients and this time it was eggs! These tasted delicious and I even had to substitute honey for the vanilla because I was out of that too! Thank you! This is my current favourite treat to make with my kids! It’s great for baking with a 5 yr old because it’s simple and he can do most of it himself. We bake them as cupcakes using silicone liners. They come out clean every time without greasing a pan and then they are portioned for me already! We call them the “Four Bite Brownies”. I use coconut oil because I like its texture the best and I always put in a healthy dose of cinnamon with the dry ingredients (adds diversity of flavour without sweetness). I double it to make about 24-30 cupcake portions. The cooking time appears to be about the same. Which flour do you use to make it gluten free? My sister is dairy and gluten free, and has a son allergic to rice. I’m always on the look out for treats for her house. 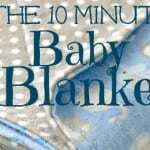 Hi Shani, thanks for sharing your tips and comments! We use my gluten free flour blend to make them gluten free, you can find it here. Gluten Free All Purpose Flour.